Authorities used riot police buses to block roads near the construction site during the rally, which ended with no reported arrests. Several hundred supporters of Greece‘s extreme right Golden Dawn party staged a protest near central Athens on Wednesday evening against plans to build a state-funded mosque in the Greek capital. After years of delays, the government has agreed to build the mosque in an old industrial area of Athens to serve its large Muslim migrant community as well as tourists. Muslims currently use prayer houses set up unofficially. A pub called “The Mulberry Tree” closed down last year in the English city of Ipswich. It’s understandable that the owners felt the need to close it — as the “Britons who have lived here for a long time” fled the area in an attempt to escape the relentless cultural enrichment, the halal community that now dominates that area of the city had no use for an establishment that serves alcohol. Now a Muslim organization has acquired the former pub and wants to convert it into a mosque. Yet the group hid its intention behind a planning application to the borough council proposing a “community centre” — nothing about a mosque. Is Social Media Really Good for Communities — or Does it Fan the Flames of Hatred? An Afghan, lightly wounded two people before being shot. His motive is unknown, but the authorities are considering the possibility that the attack was terror-related. The article doesn’t include the news that the two lightly-wounded victims were American tourists. For more on that development, see for example this BBC report. 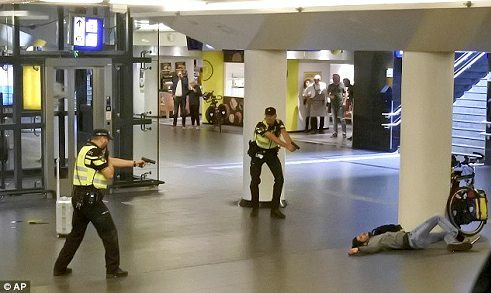 JIM is not mentioned in any of these articles, but the Dutch authorities have been forced to admit that Jawed S. had a “terrorist motive”. Are we surprised?